1,000 lbs. and 700 lbs. capacity fertilizer seeder/spreaders are suitable to spread chemical fertilizer as well as to sow wheat, rye and several other seeds along with sand. 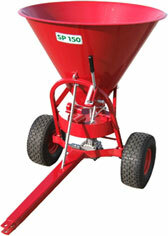 The seeder/spreaders are equipped with double lever regulation system for easier use. The vanes can be adjusted so as to obtain maximum accuracy and uniformity of distribution. 400 lbs. 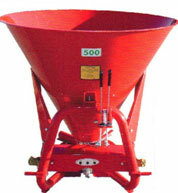 capacity fertilizer spreader pull type is suitable to spread a various variety of fertilizers, seeds, salt and sand. The movement of the wheels makes the disc with spreading vanes turn: the advancing speed determines the spreading width. This spreader can be pulled with an ATV or by a small tractor. 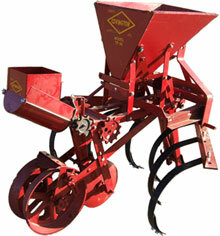 The planter/cultivator is designed to plant and fertilize all row crops in one easy operation. You can depend on Covington to give you accurate depth control on uneven land and trouble free planting without clogging from trash or debris. This one row combination offers the small gardener or truck farmer a planter that has been proven for over 100 years. 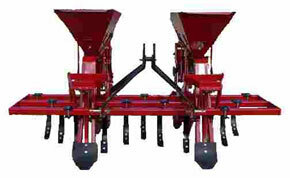 The two row Covington planter is mounted on a two row spring tine cultivator.